This weeks readings mostly focused on several sections from The Art of Tinkering . These included Tinkering Tenets and chapters on the works of artists Jie Qi and Grace Kim. Here’s what I wrote for my reflection piece on the Tinkering Tenets. As I read over the Tinkering Tenets, I was struck by how many of these I see in action in my Makerspace everyday. Not only that, but how many times I’ve used similar words or phrases to describe our space and how our students use it. My favorite is: create rather than consume. My students have become so ingenuitive since we started our Makerspace. They’ll see a problem, like our motion detector lights turning off when no one is walking around, and rather than trying to purchase a solution, they make their own. I want my students to be inspired to create rather than consume, to be okay with getting stuck, and to take their work seriously without taking themselves seriously. The chapters on Jie Qi and Grace Kim really struck home for me. Long before I ever dreamed of being an educator, I have always been a crafter. My mom taught me how to sew in high school, and I learned how to knit and crochet in college. My very first blog was a knitting blog (now defunct) and I even had one of my projects featured on Craftzine, an offshoot of Make back in 2007. One of the things that first drew me to the Maker Movement was the idea that making things could be a way for students to engage in STEM and creativity. Bringing it back full circle, these two artists have created amazing, spectacular pieces with paper and fiber, respectively. I love how beautifully they’ve incorporated technology into their work. Check out Jie Qi’s site – her work is fantastic. Jie, by the way, is the creator of Chibitronics. 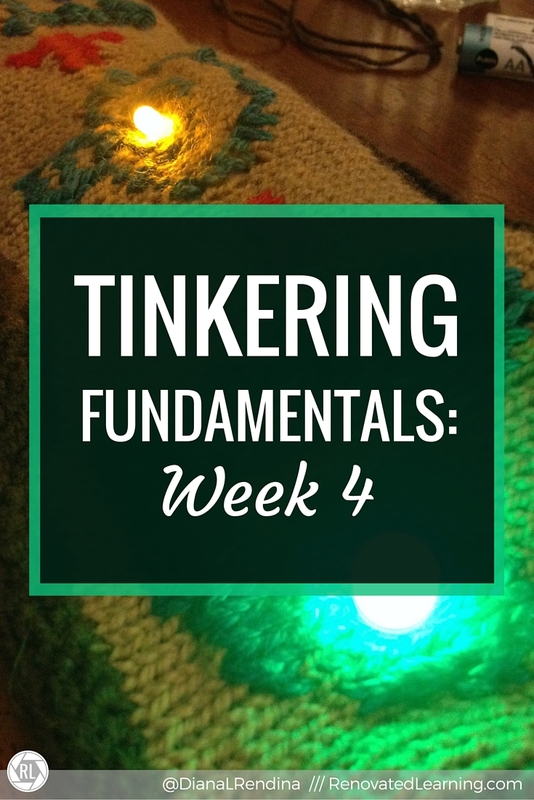 This week’s hangout looked at how tinkering can tie in beautifully with a variety of national science standards. It’s definitely worth a watch, especially for those who are being questioned as to the educational value that tinkering has and how it ties in with standards. This week’s activities were my favorite ones yet. 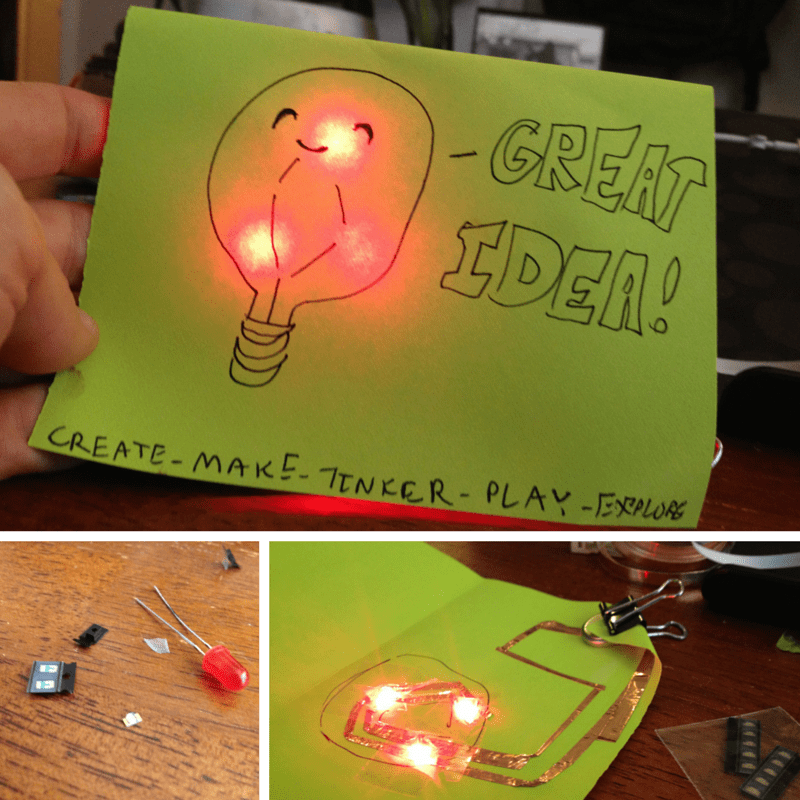 I tried both paper circuits and sewn circuits and definitely want to bring these activities into my Makerspace this year. The paper circuits were pretty easy once I figured things out. I drew my design, decided how I wanted to lay out my LEDs, laid out the copper tape, and attached a battery. I tested it out first with a larger LED since I didn’t have a multimeter on hand. It took me a bit to figure out the surface mount LEDs – I didn’t realize that they were in packaging – those things are tiny! Eventually I got everything together and ended up with an awesome light up card. 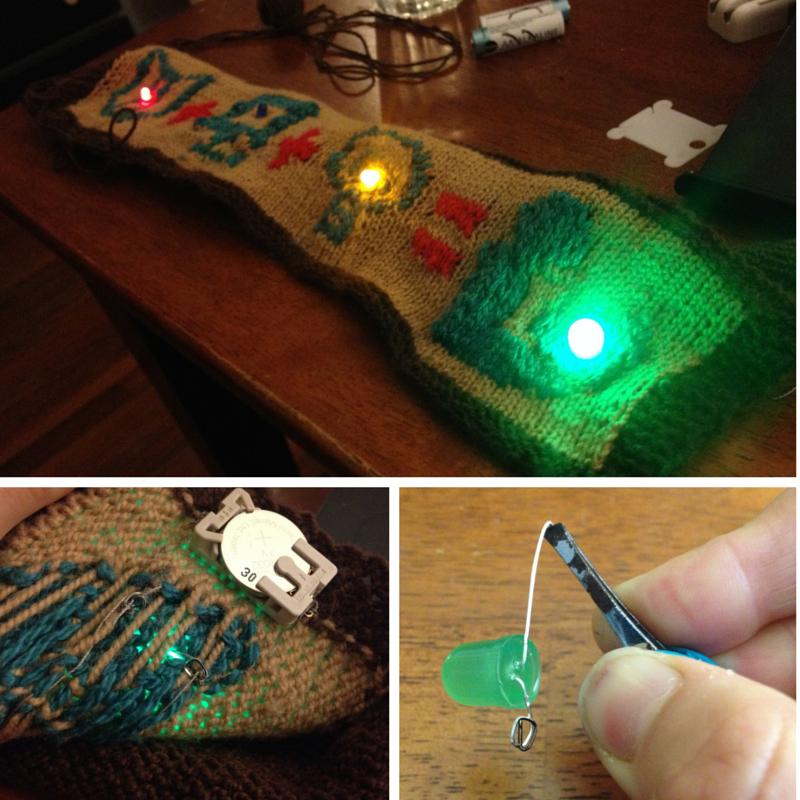 For the sewn circuit, I decided to use an old knitting project as my base. Back when I first started this blog, I called it Intarsia for Technicals, based off a knitting technique called intarsia that combines multiple colors of yarn to create pictures. I knitted up a banner for the header, but then decided to change the name and build a different header.